In the Autumn term each year we organise a colouring competition for the children of St. Luke's and Woodlands primary schools. We work closely with St Luke's Primary as described to the right, and also with Range High school as described here. St Luke's is a Church of England (Controlled) Primary school. This means that it is controlled by the local education authority, but has both an Anglican foundation and church representatives, known as foundation governors, on the Governing Body. One of those foundation governors is Chairman of Governors. 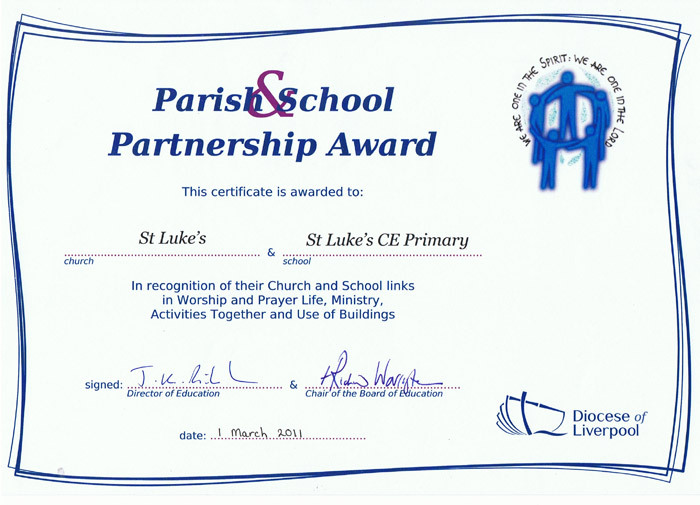 Both the school and St Luke's Church value the close relationship. Members of the church visit the school regularly, especially our vicar, helping in classes or leading collective worship. The Church Council receives regular reports from the Foundation Governors and Mrs. Cowey, the headteacher, keeps the parish up to date on school events through her articles in the Parish Magazine. The close links between the church and school are recognised by a church-school award. See the certificate below. The children make many visits to church: Harvest, St Luke’s Day (18th October), Christmas, Ash Wednesday, Easter, and the end of the school year. 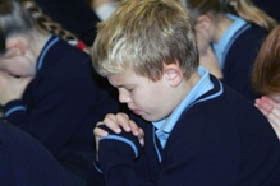 Older pupils are invited to participate in the ordinary mid-week services occasionally. Some pupils also use the church for fieldwork, examining the history of the building, the graveyard and the religious artifacts. School and Church share several fundraising events, most notably the Harvest and Lent Projects each year. There is some form of collective worship held in school each day. This may be a key stage assembly or a class assembly. There is a weekly "Superstars" celebration, when pupils are presented with certificates as a reward for good behaviour and/or outstanding work. Otherwise, collective worship is broadly Christian based, but also includes knowledge and understanding of other world religions. Parents have the right to exclude their child from Collective Worship if they wish. For more information about the school please go to its website.